If you have followed my blog for while, you know that I love using read alouds in my classroom. They are a great way to build community, expose students to a variety of text, and to teach reading skills. 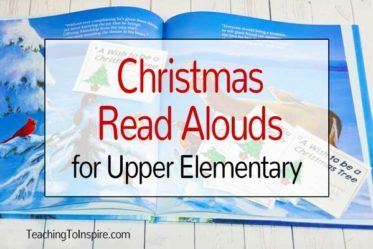 For more information about the benefits of using read alouds in upper elementary classrooms (with implementation tips), click HERE to read a previous post I wrote. For this post, I want to focus on the actual process of planning read alouds to maximize instructional impact and increase student engagement. I am going to share with you two different options that you can use to plan. Before I dive into this, I will mention that I do not do this for every read aloud. I do this for my main read aloud that teaches my focus skill. Other read aloud discussions are guided my students’ needs, interests, and thinking while I am reading. To begin, here are some materials you may want to make sure you have in addition to great read alouds. 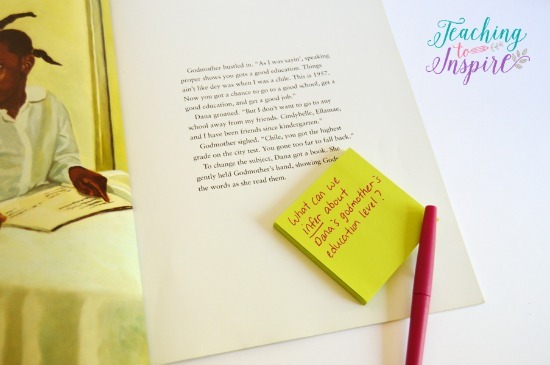 Sticky Notes – Because I have been planning read alouds for many years, I am able to plan using only sticky notes. I write all of my questions and answers on sticky notes and then place them at the stopping point in the book. Anchor Charts – I use the anchor chart to record my focus skill notes and the main focus question I will ask students to think about as they listen. Optional Planning Template: You can use this planning template in lieu of or in addition to using the sticky notes. Grab the template here. 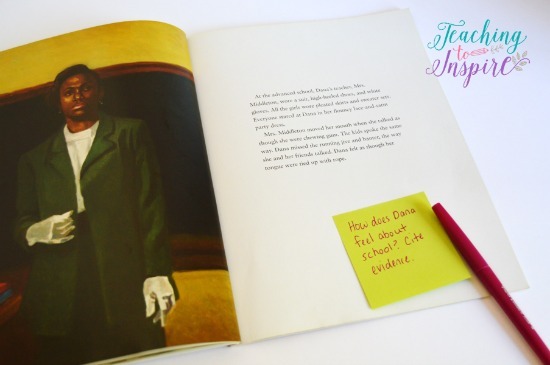 Sticky Notes – I give my students a “purpose for reading” question before I begin the read aloud. The students use the sticky notes to jot down their thoughts or evidence as they listen to the story. Reading Notebook – My students use their reading notebooks to record responses that will last longer than a day. When choosing a read aloud, I have my focus skill in mind. I want to choose a book that clearly allows my students to practice the skill or strategy. After I have chosen a book, I use sticky notes to plan my questions and teaching points. I jot them down on the sticky note and then place it in the book on the page where I will ask the question or teach the teaching point. If you want to do something a bit more formal, you can use the optional planning template that I mentioned earlier. 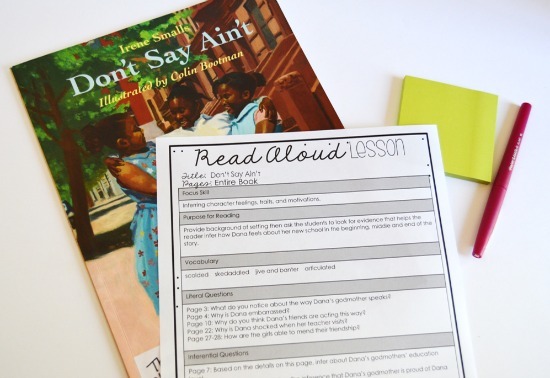 Click here to download the template and an example lesson plan for the book Don’t Say Ain’t by Irene Smalls. When I am reading the book and planning my questions, I specifically plan for literal and inferential questions. I want a healthy mix of both for each book that I read. I also make sure that at least half of my questions tie back to my focus skill. My other questions are general comprehension questions or review questions for reading skills I have already taught. I also plan for how my students will apply this reading skill into their own independent reading, book club, or guided reading. This is an important piece of read alouds. You want the students to be able to transfer and apply the skill to their own reading. 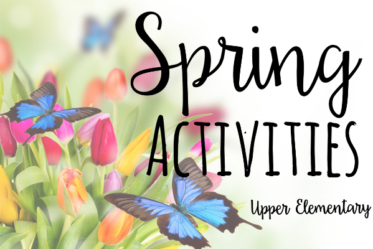 I also plan an extension activity (more about those options near the end of this post). Now let’s take a look at how all of these pieces come together during the actual read aloud. After I introduce the read aloud and provide any necessary background information, I always provide my students with a purpose for reading. This is usually a question that spans most of the book. The purpose also connects back to the focus skill. My students use sticky notes or their reader’s notebook to record their thoughts in response to the “purpose question” while they listen. Inferential Questions – I use turn and talk when I am asking inferential questions because I want all of my students to have a chance to think and discuss with a partner before I ask for students to share their ideas with the class. For turn and talk, my students turn to their (assigned partner) and take turns discussing the question. Remember how I mentioned that I write my questions on sticky-notes? This makes the actual delivery of the lesson super easy. When I come to a page with a sticky-note, my question is right there ready for me to ask the students. This is an important part of read alouds that some teachers skip or miss out on.When I teach a skill or strategy through a read aloud, I explicitly plan how I will have the students apply this to their independent reading. This serves two purposes: it holds my students accountable for their independent reading and it makes that reading purposeful and allows for meaningful practice of the reading skill. Review another key reading skill with the same read aloud. For example, if your focus skill is making inferences but the book is also great for theme, ask your students to identify the theme independently. You can even assess their answers since this skill is a review skill. Provide a writing prompt for the students to complete. This can be a creative prompt (rewrite from different point of view, rewrite the ending, etc), informational (compare and contrast two characters, write a summary of the text, etc), or persuasive (which character is the most important, which event has the most impact, etc). 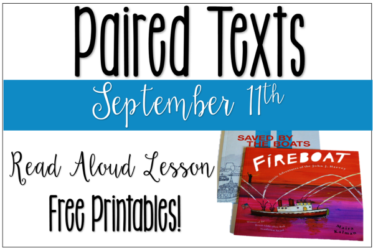 Pair the read aloud with another text to work on paired texts. 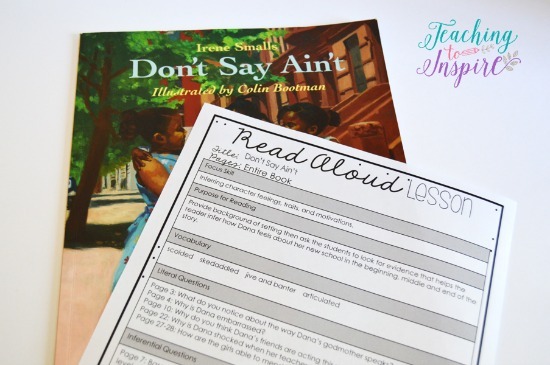 Click HERE to download the template that you can use to plan and the completed read aloud plan for the book featured in this post (Don’t Say Ain’t by Irene Smalls). 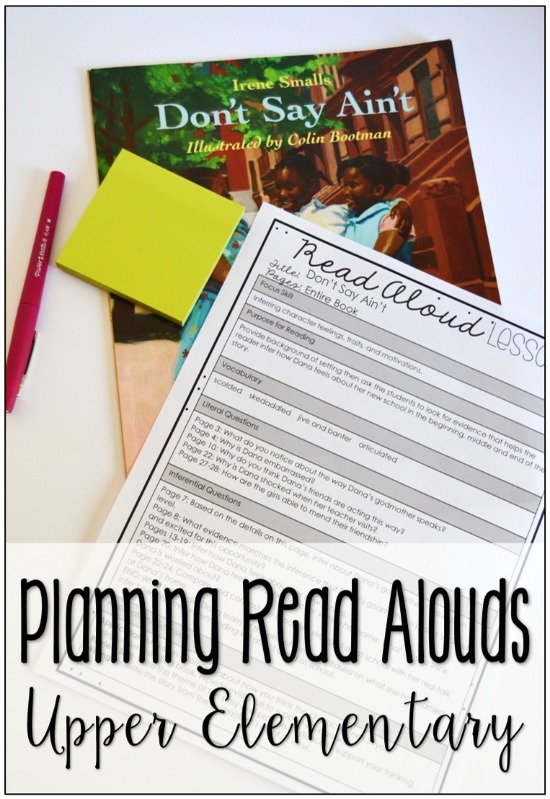 To see all of my posts about specific read alouds (most with freebies!) click HERE. 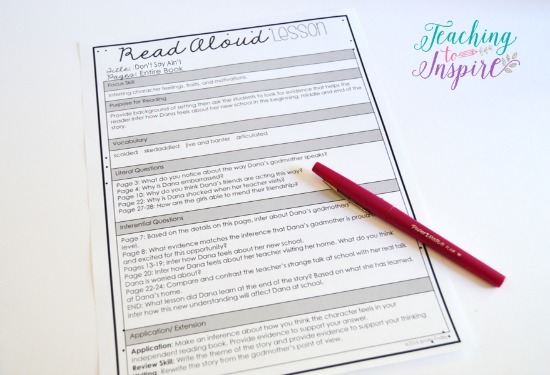 Do you use a similar routine when you plan your read aloud? Share your “planning read alouds” process in the comments! Hi, would you have any advice on helping students struggling in phonemic awareness? Thanks in advance! I would like to know more about how learn alouds will help students who have difficulty in speech. Hello! This post is so helpful for a first year teacher like me:) I am wondering how you incorporate the vocabulary into the read aloud?